The Second Wind Foundation is a 501(c)(3) foundation established to fund the shipment of books, educational materials, and containers to the Rotary Humanitarian Aid Centre in Johannesburg. There are two distinct products of this project. First and foremost are the books and educational materials. Secondly, the containers are purchased and donated to the South African Rotarians who convert them into school rooms, libraries, clinics, community centers, cottage industry training facilities, school kitchens, and AIDS orphans day centers. The secondary usage developed from the need to avoid paying rent on a container while waiting for a workable volunteer labor schedule for unloading the container. Some funding of the shipments comes from the Rotary Foundation via matching grants but the Rotary Foundation will not fund the purchase of the containers. Also the volume of the flow of books from the USA to South Africa is high enough to make reliance on a grant impractical because of the processing time. When the warehouse is full then we must ship if we are going to be able to be hosted at no cost by a professional, for-profit business. Most of the funding for the project is provided by contributions from Rotary clubs and districts, companies, and individuals to The Second Wind Foundation. We could use your help! 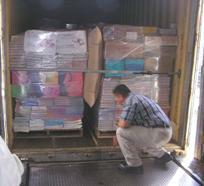 Approximately $2,500 buys a container and $4,000 covers the ocean freight.